The waves roll in, but not with any sort of ferocity. It's so quiet. It's so serene. Sometimes the world feels small but not while you are standing on a beach staring out into an empty and seemingly endless ocean. Sometimes the world feels scary but the evils of humanity, the dangers of accidental randomness are literally behind you here. Cars crash, fires burn and people kill, but the tide poses no threat. The sun goes down and the sand between your toes is moist and cool. The stars come out and the glow of the moon on the beautiful, blue rippling water is unforgettable. You have never felt safer in your life. A simple online search tells us that the chances of being killed by a shark are 1 in 3,748,067. In the words of the handsome space cowboy Han Solo, never tell me the odds. Numbers exist in reality and they can be trusted because numbers represent truth without bias or fear or emotion. My mind doesn't care about numbers when lost in one of the greatest pieces of cinema ever, a work by Steven Spielberg that speaks louder and resonates deeper than any numbers could, no matter how honest they are. It's so illogical to be believe in fictional storytelling rather than let the truth guide us, but to be human is to defy logic. Based on numbers, it is absurd to be afraid of flying, yet so many tremble with dread as they board an airplane, literally praying that they will land safely at their destination. They have more faith in an unseen and unproven God than they do in odds. 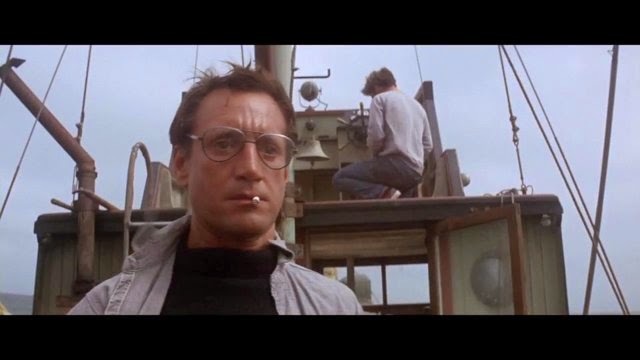 The absolute brilliance of Jaws is that even knowing that 3,748,066 people will swim in an ocean and emerge from the water unscathed, the audience is terrified of being that unfortunate 1. The iconic piece of music by John Williams starts echoing through our minds and we aren't afraid of crashing cars or burning fires or the person that approaches us through the shadows of night. I experienced this masterpiece from the comfort of my couch and the closest drop in the massive ocean bucket is roughly a thousand miles away, yet I felt as if I could be the next victim. When Brody (Roy Scheider) looks out at the water and sees nothing, the water is no longer quiet. It's no longer serene. Knowing the great white is somewhere out there, lurking in the depths where the human eye cannot see is scary as hell. What are the odds I lose my life in a shark attack as I sit on my couch watching a film? Well, zero of course. It's impossible, yet such logical thinking doesn't comfort me in the least, not after watching Jaws. During a film like this, I don't want to hear any of the numbers. I want to get lost in the storytelling. Never tell me the odds.